What Airline Has the Best Food? Flight search engine Skyscanner pooled passenger's opinions and released a list of the top airlines for in-flight meals, and not a single U.S. airline made the cut. 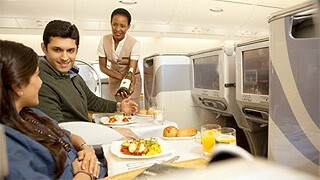 The carrier that claimed the title for best airline food is Emirates, the national airline of Dubai. In economy class, the airline serves three-course meals that include entrees such as lamb marinated in Arabic spices accompanied by peppers and other veggies. Another popular option is grilled chicken breast with caramelized plums served alongside mashed potatoes. "Emirates is passionate about providing great in-flight cuisine and we see it as a crucial part of our product offering. Individual menus are carefully planned for each route we serve to ensure we cater for the diverse cultures and preferences of our international customers," Robin Padgett, Emirates' Vice President of Aircraft Catering tells Skyscanner. "It is particularly rewarding to have received this accolade directly from the most discerning of judges – the traveling public," Padgett adds, referring to the fact that Skyscanner surveyed 1,200 people to compile the rankings. Six of the top 10 airlines were based in the Middle East and Asia, with Singapore Airlines taking third place, and Qatar, Malaysia Airlines, Thai Airways and Etihad claiming spots five through eight, respectively. "It is interesting to see these Middle Eastern and Asian airlines ranking so highly. Airline food is notorious for being bland and perhaps it is the use of these strong eastern flavors and spices that is contributing to their popularity," says Skyscanner Director Barry Smith in a statement. The other four airlines that made the grade are based in Europe, with Lufthansa securing the runner-up spot and flagship Russian carrier Aeroflot taking fourth place. KLM and Air Frances rounded out the top 10 list.